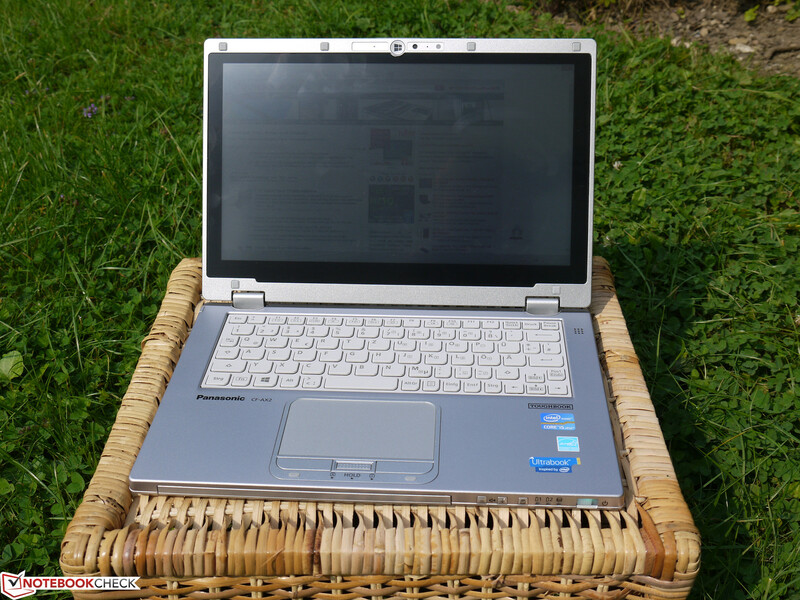 Light-weight ultrabooks are ideally suited for mobile use: Long battery life, decent performance and great portability lead to a broad spectrum of possibilities. A professional workhorse has to fulfill a number of additional requirements, ranging from reliability and flexibility to robustness and compatibility. 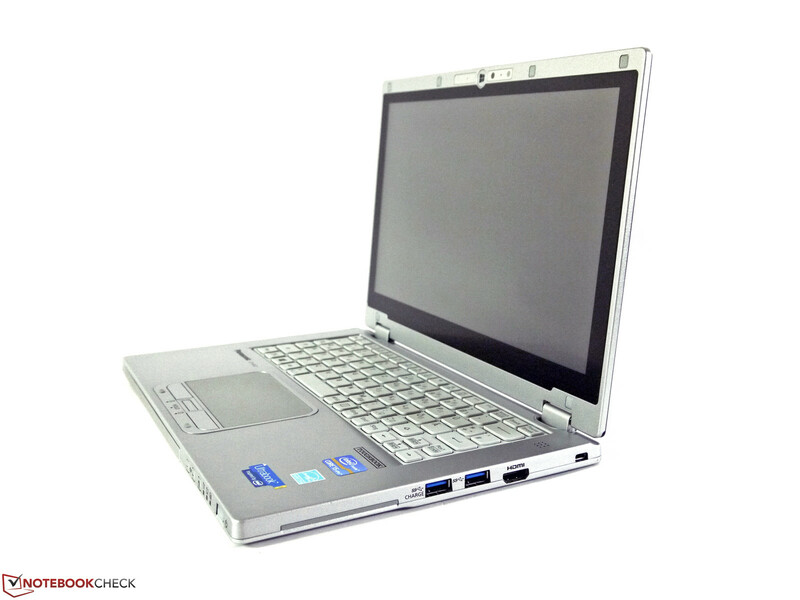 Panasonic's Toughbook CF-AX2 is built for exactly these kinds of rough daily business usage scenarios. Thanks to its special hinge (360 degrees! 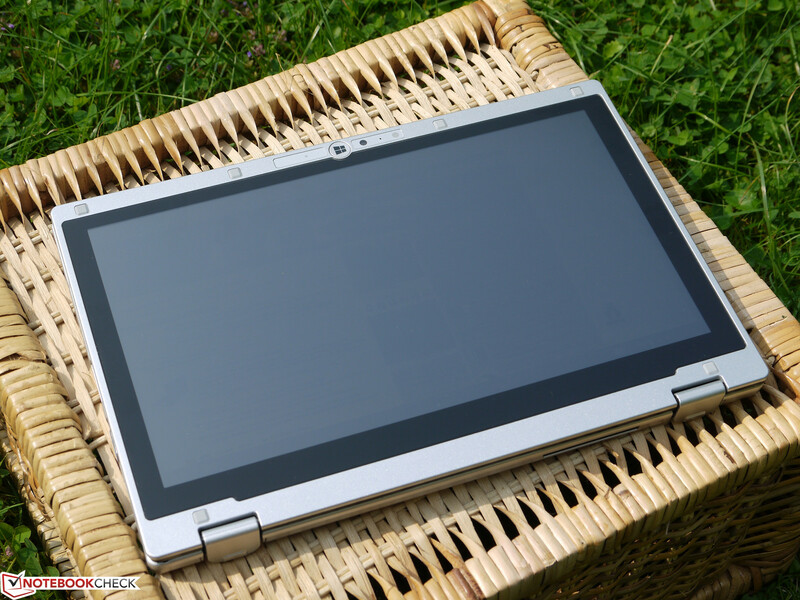 ), it can be used both as a laptop and as a tablet with just a little bit of folding, turning it into a convertible, a true hybrid ultrabook. The CF-AX2 comes with an 11.6-inch multitouch display, an Intel Core i5-3427U-CPU, 4 GB of RAM, a 128 GB SSD and two batteries with 31 Wh and 17 Wh. With premium features comes a decidedly premium street price of more than $2000. 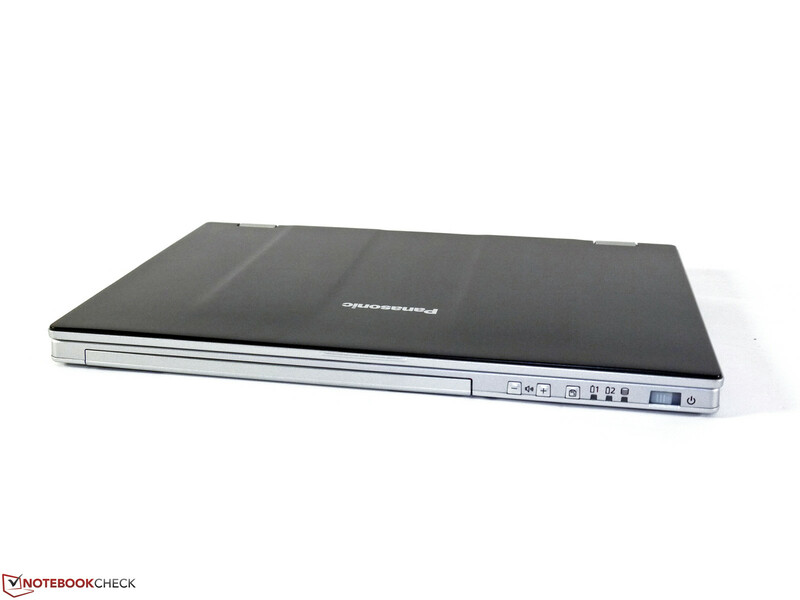 According to Panasonic's PR department, the Toughbook CF-AX2 is the lightest 11.6-inch hybrid ultrabook, tipping the scale at just 1.15 kg. With Sony's Vaio Duo 11 coming in at almost 1.3 kg, the Asus Taichi 21 weighing 1.25 kg and true business convertibles such as the HP EliteBook Revolve 810 or Fujitsu's Lifebook T902 weighing even more, this is not too outlandish a claim. 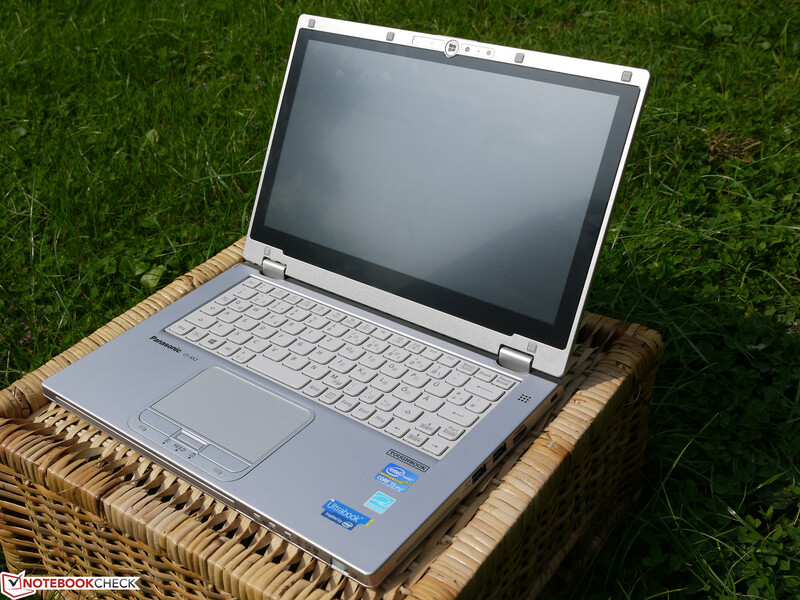 Still, despite its light weight, the Toughbook offers some sturdy construction. The case is supposed to be able to resist up to 100 kg of weight and falls from up to 75 cm high. In addition, it is splashproof and thus somewhat liquid-repellant (a claim we didn't test on our device). The palm rest feels solid, the display hinges come with a non-slip coating and the display lid is very torsion-resistant. 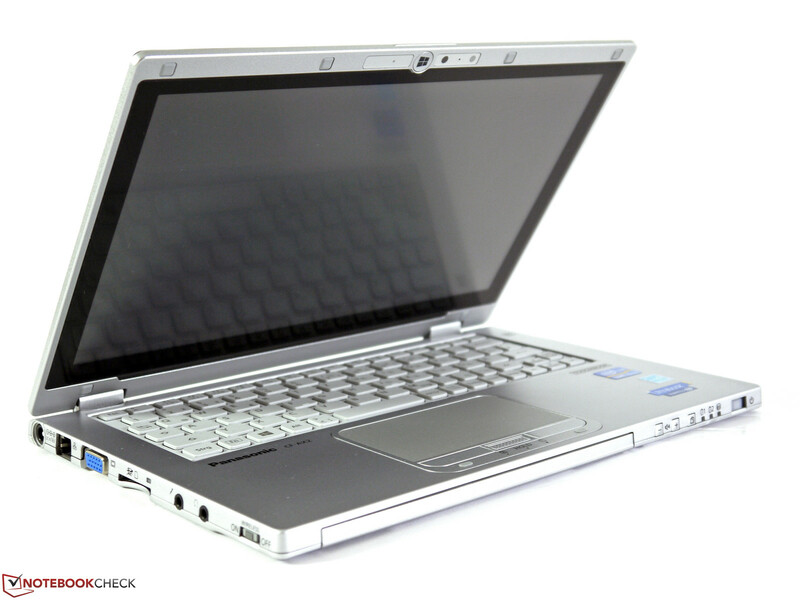 It takes some time to get used to the loud cracking sound which occurs whenever the display lid is closed, likely due to the locking mechanism which keeps the laptop reliably shut. All metal surfaces feel well-built and make a low-maintenance impression to us. 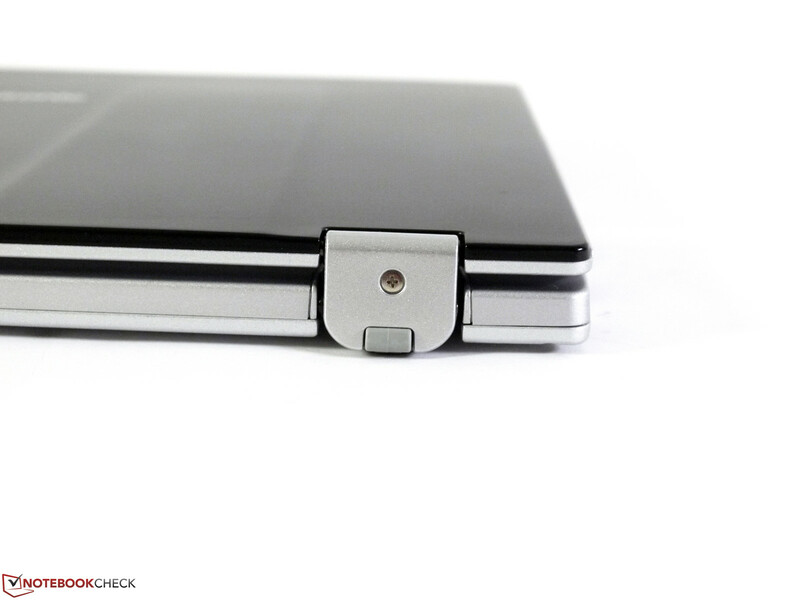 One minor hassle: The release mechanism of the replaceable battery is a bit inconvenient since the locking slider has to be held in the opening position at the same time. 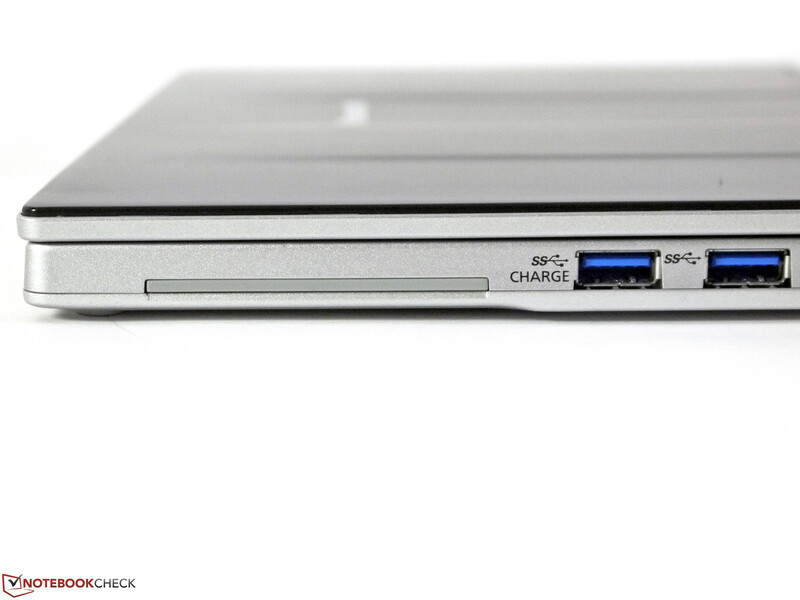 Not many ports can be found on the device - something which is often the case with ultrabooks and subnotebooks. Still, the variety is well-chosen for practical purposes, ranging from standard ports such as 2 x USB 3.0, HDMI, Gigabit Ethernet and a card reader to an analog VGA port and two separate audio jacks. 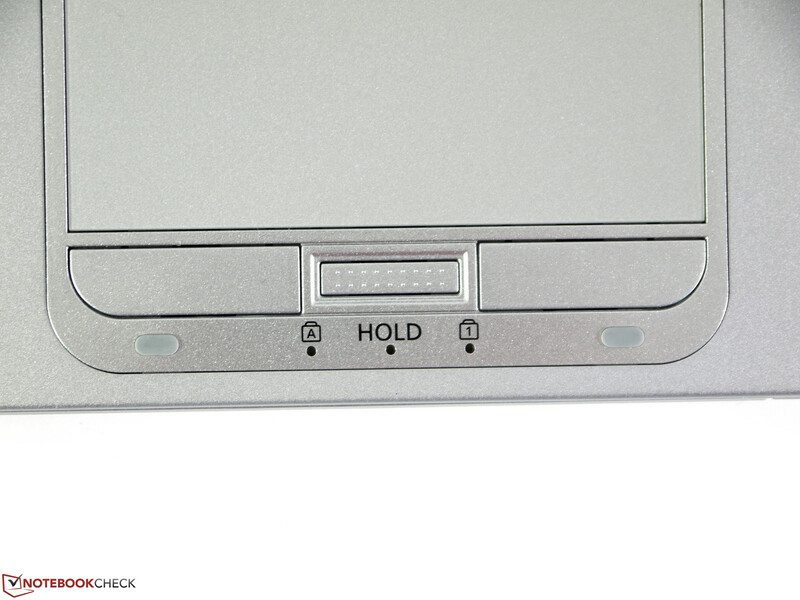 The analog display port is capable of Full HD output (1920x1080 pixels), leading to a sharp, detailed image on an external Asus PA238Q display. 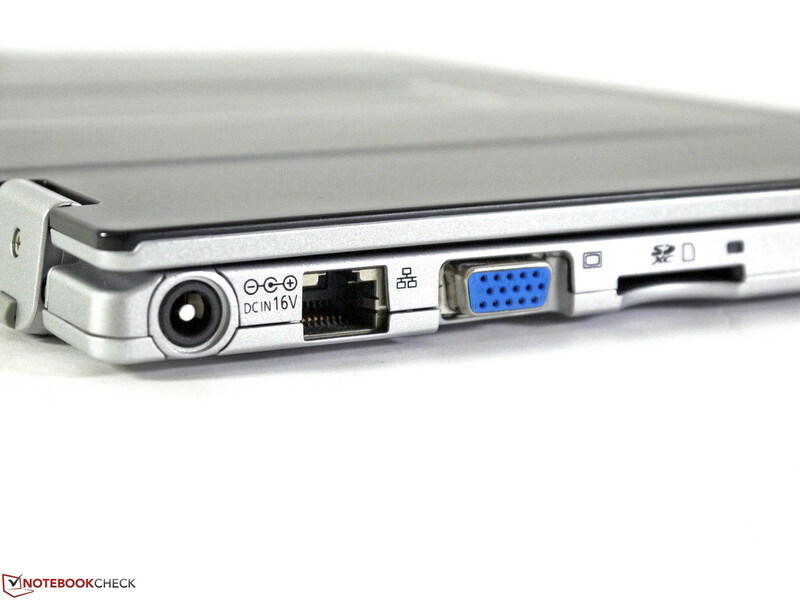 Most of the ports have been moved to the rear part of the laptop in order to reduce the amount of cables in the way of the mouse or other peripheral devices. Still, there could have been more of a distance between the two USB 3.0 ports and the HDMI port, as adapters or large flash drives might get in the way of each other. Intel's Wireless Advanced-N 6205 module comes with two antennas, being capable of dual-band transmission (2.4 and 5 GHz) and data transfer rates of up to 300 Mbit/s. During actual usage, this module has proven to be slightly better than the Atheros R9485WB adapter in the Asus N76VZ in terms of reliability. Nothing bad can be said about the Wi-Fi connection. 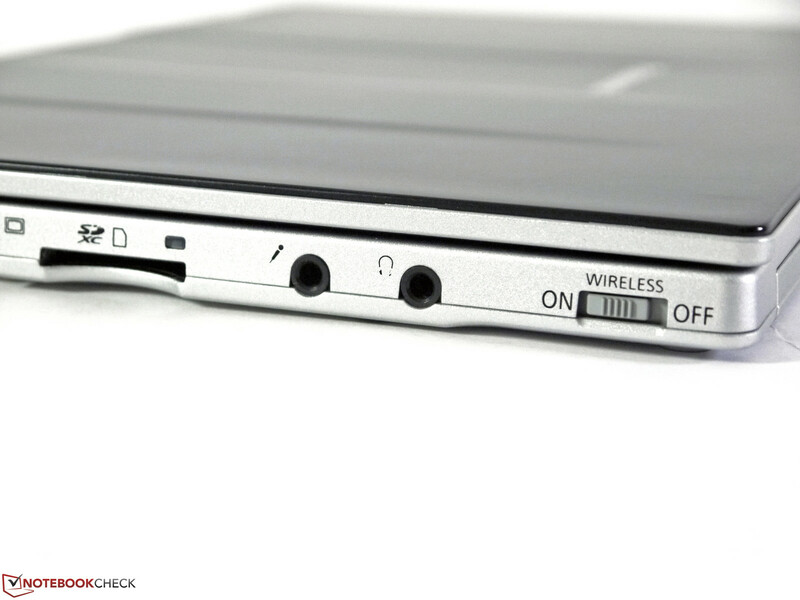 In addition, the laptop comes with Bluetooth 4.0 and a WWAN module made by Sierra Wireless, with the associated SIM card slot being found in the battery bay (as usual). This MC8305 module supports the HSPA+ standard, with up to 14.4 Mb/s downstream and up to 5.76 Mb/s upstream. For video conferences or voice chats, both a 720p webcam and an integrated microphone are available. 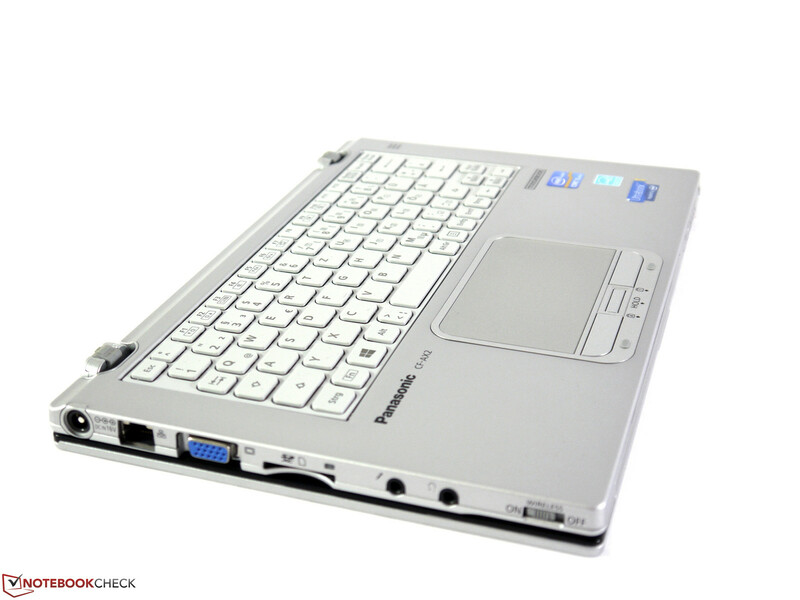 Next to a number of password options, the Panasonic Toughbook CF-AX2 only comes with a Trusted Platform Module 1.2. While a smart card reader can be purchased optionally, no fingerprint scanner is available. There is not much to be found in the box. 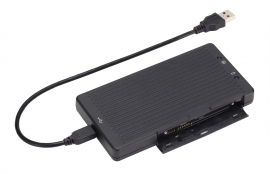 An optional battery charger CF-VCBAX11EA and a replacement battery CF-VZSU81EA (31 Wh, same capacity) can be purchased online for approximately $100 each. 20 screws have to be loosened before the entire bottom panel can be lifted. Afterwards, both the fans and the module banks can be accessed. Unfortunately, no RAM upgrade is available (at least, two modules have been used, being operated in dual channel mode). Basically, the only upgrade option is via the mSATA slot, where the 128 GB SSD made by Samsung could be replaced with a larger model. 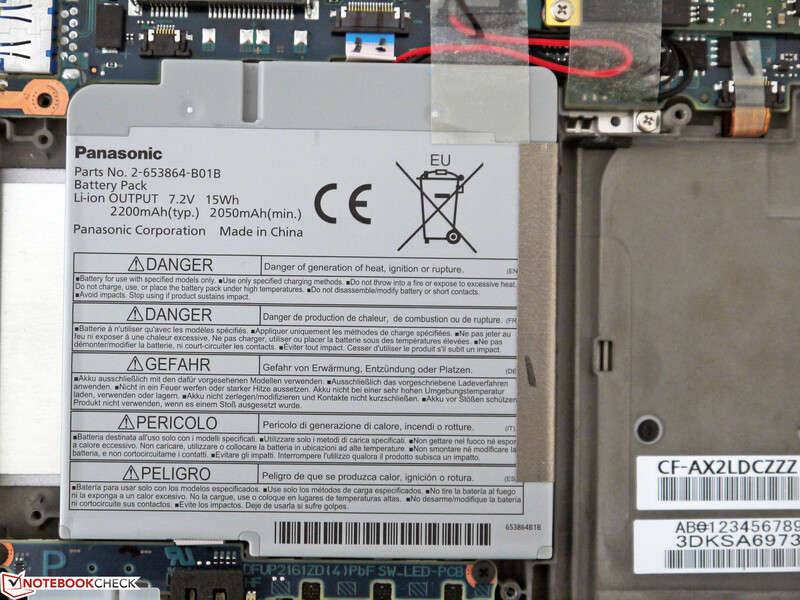 While the radio modem modules could be replaced as well, this is less likely to happen during the Toughbook's lifetime. 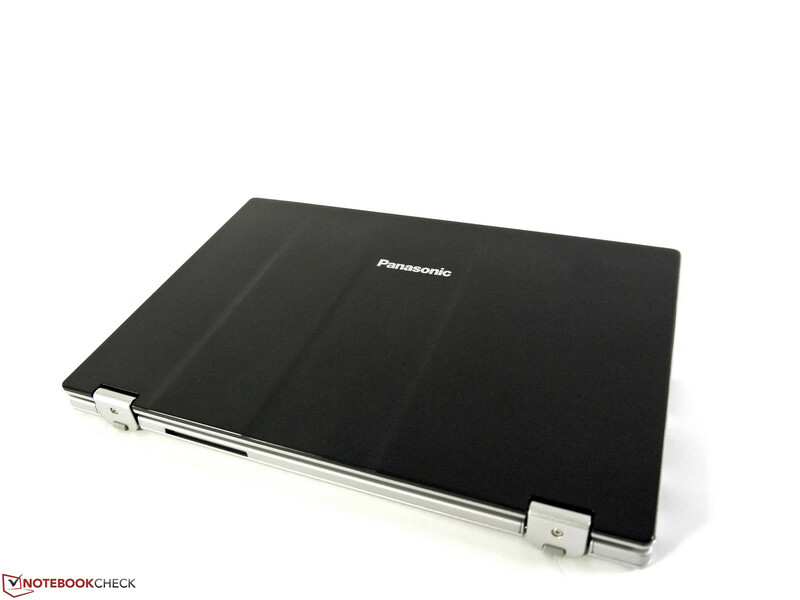 The Panasonic Toughbook comes with a standard warranty of 36 months (next to the obligatory legal requirements). For an extra fee of ~$150 or ~$200, an upgrade to 48 months or 60 months of warranty can be purchased. 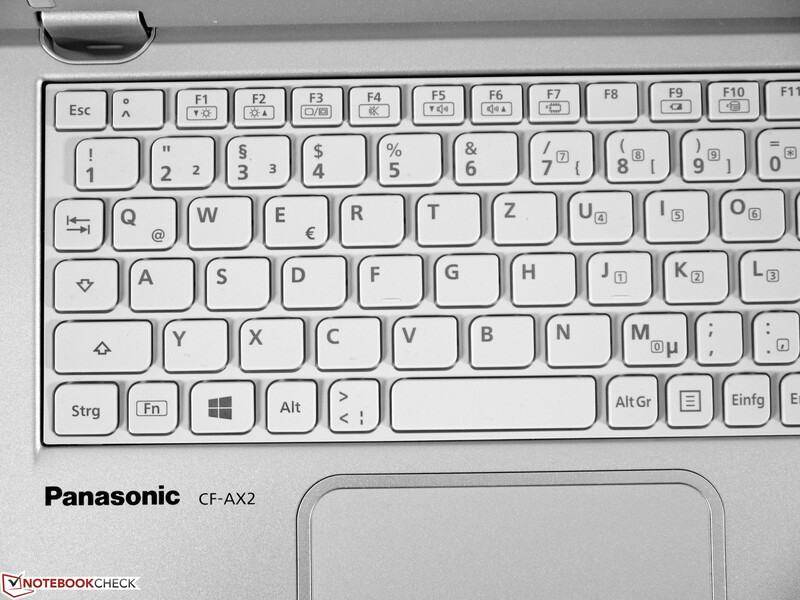 Smallish keys, most of them spaced 18 mm apart from each other, prevent a more comfortable typing experience. Especially the Space, Return and Tab keys should have been larger. There is a lot of unused space on both sides of the keyboard - most likely due to the rugged construction. Key travel is short, but there is a firm pressure point and not too much noise. Unfortunately, the low-contrast lettering and the missing backlighting system make typing in dark places a lot harder than it has to be. 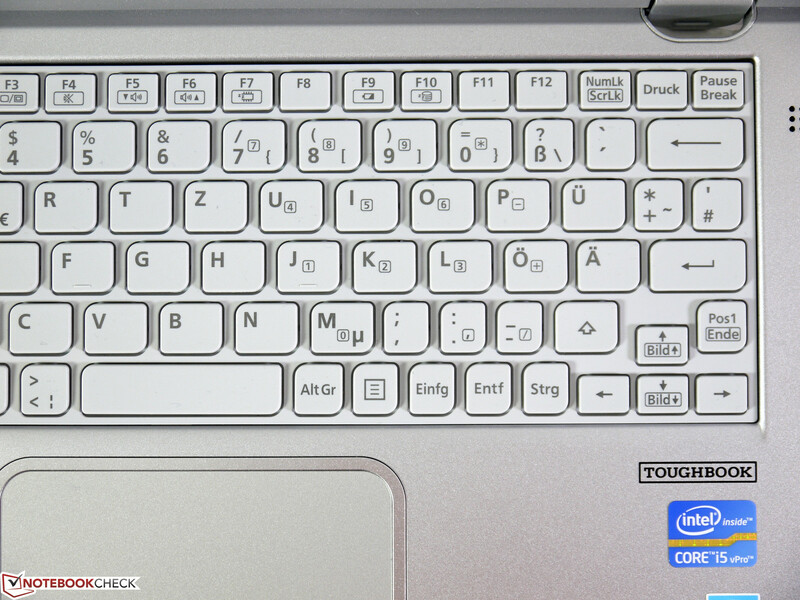 In addition, the unusual layout next to the Space bar (where a number of additional keys such as Insert, Delete and "<>" have been placed) takes some getting used to. 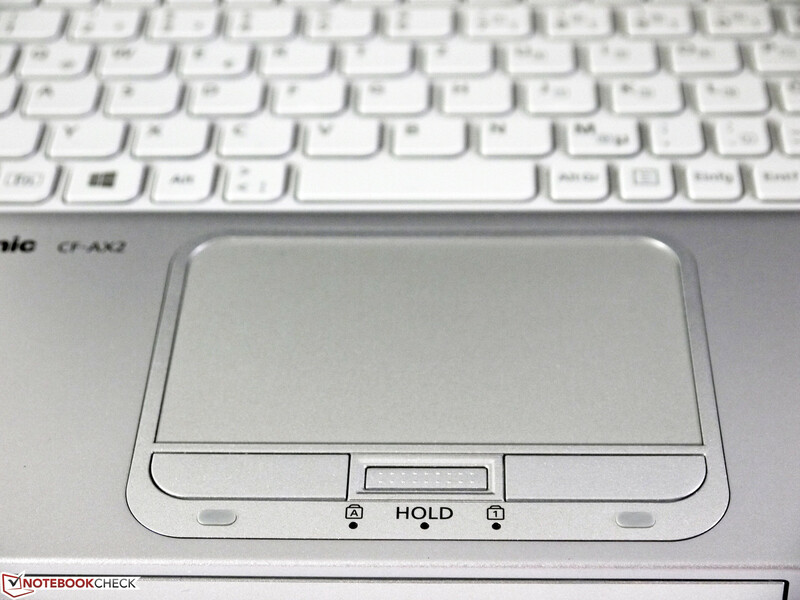 The touchpad is 93 x 53 mm large. This is sufficient for multitouch usage and the gestures used in Windows 8. It reacts well and reliably, with some smooth gliding over its surface. 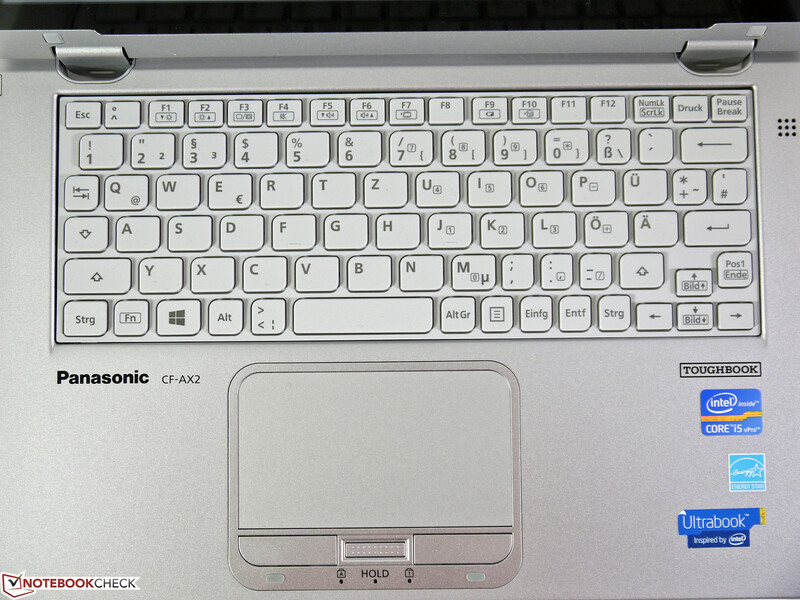 The separate touchpad buttons come with seriously short key travel, but they also work reliably. The capacitive matte multitouch screen (no digitizer) struggles with no serious disadvantages when compared to the usual glare-type touch displays. 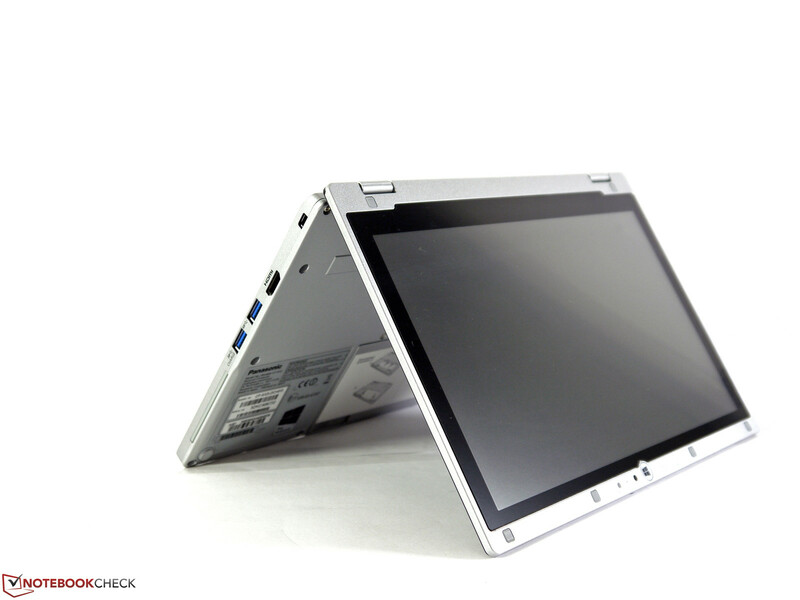 While the surface feels a bit rough, it offers the same comfortable touch experience. Icons, symbols and fonts are large enough "thanks" to its rather low resolution of 1366x768 pixels so that finger input is precise enough even in desktop mode. In tablet mode, not only the usual finger gestures can be used, but they are accompanied by a number of hardware buttons at the edge of the device, namely a rotation lock and volume controls. 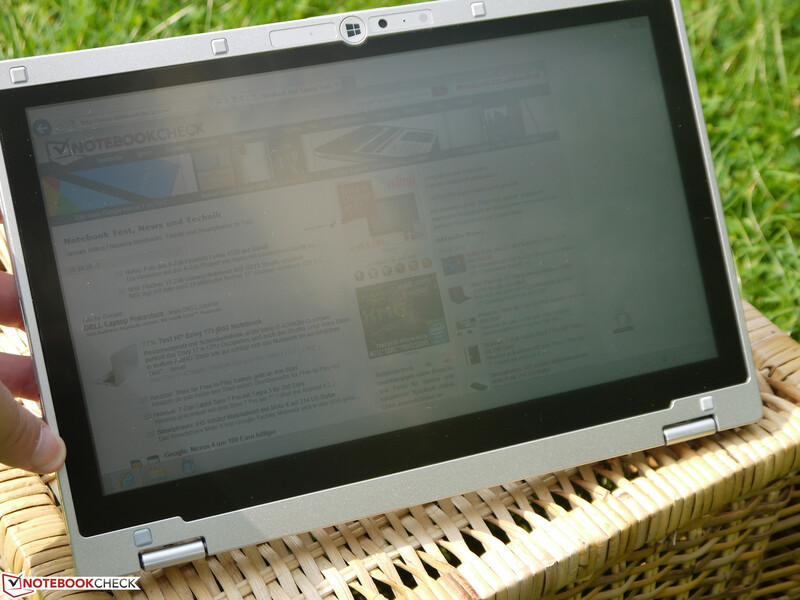 Next to the display itself, there is also a Windows button which leads directly to the homescreen. Multitouch display - with a matte surface! 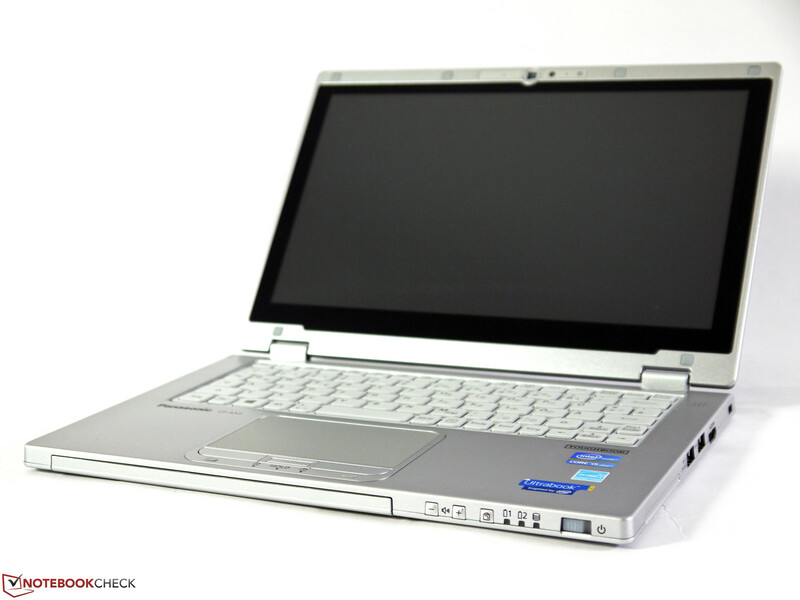 The Panasonic Toughbook CF-AX2 comes with an 11.6-inch HD display made by LG. 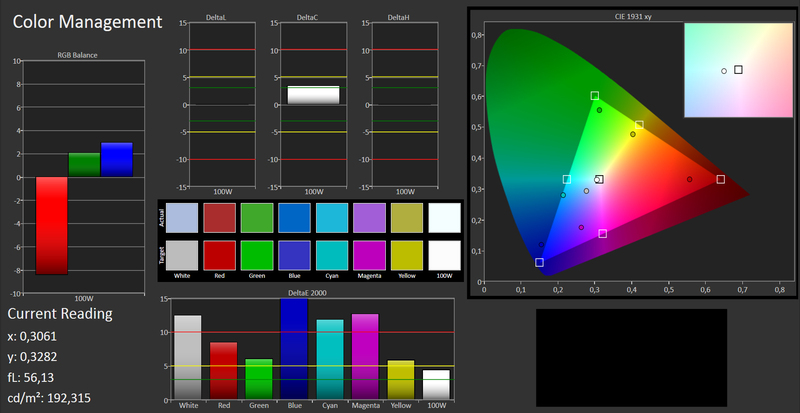 Its resolution of 1366x768 pixels comes down to 135 dpi which should be enough for most users. 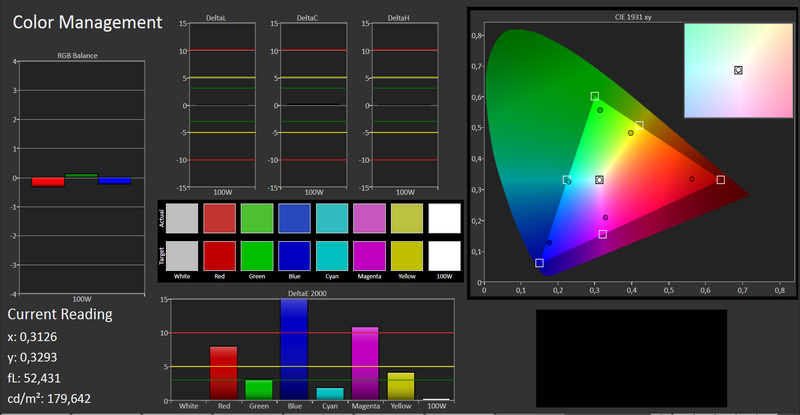 Still, when compared to competitors with HD+ or Full HD displays, a lot of screen real estate and fine details are lost. On an external display all common resolutions can be used without exception. One huge disadvantage of the display becomes evident almost immediately. While such a compact, lightweight device is perfectly suited for outdoor usage, actually doing so is barely possible in the case of our test device. 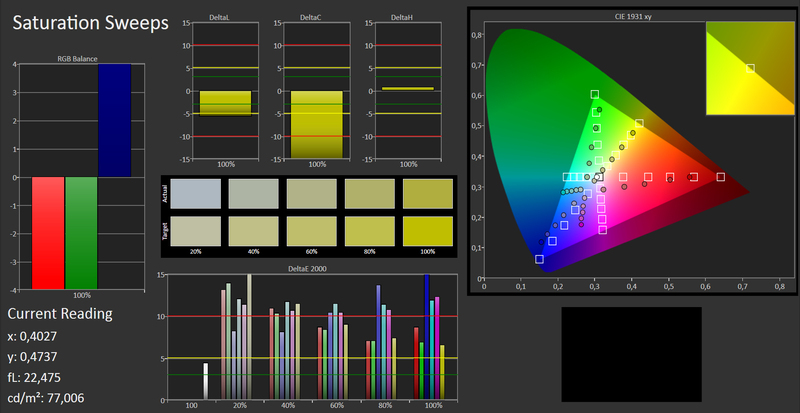 We measured brightness levels of between 164 cd/m² (center left) and 187 cd/m² (right lower corner), leading to a low average value (for such a premium device) of just 175 cd/m², with a brightness homogeneity of 88%. 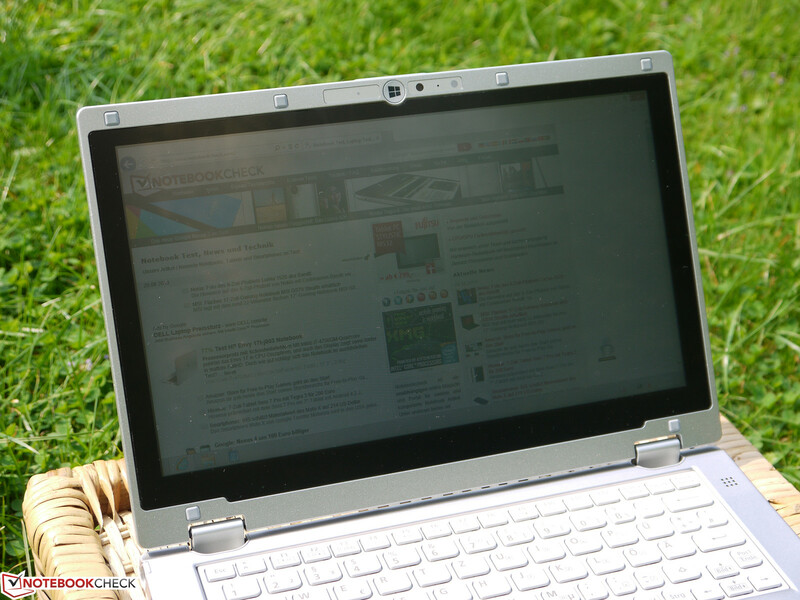 During actual usage, this means that next to nothing can be seen in direct sunlight, while the screen remains more or less readable in the shade. Indoor usage shouldn't cause any problems, thanks to the matte display which prevents almost all annoying reflections. The brightness can be adjusted with 10 steps. Step one results in a mere 10 cd/m² while step eight delivers 142 cd/m² - this is the setting that we used during our Wi-Fi-based battery tests. The contrast fares a bit better. 458:1 is slightly above-average when compared to our long-time average of all test devices. 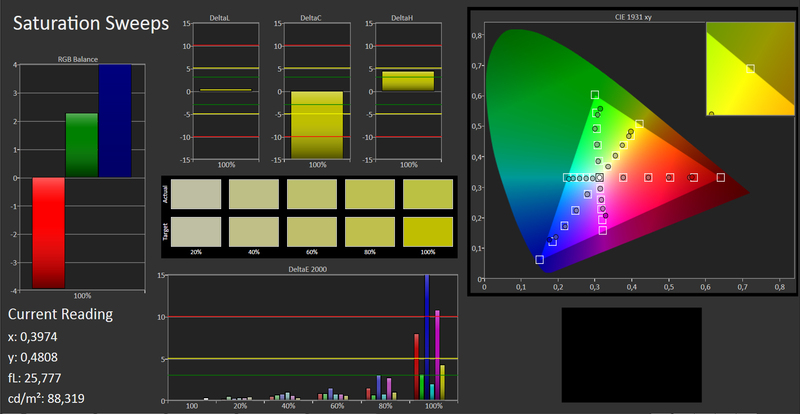 Color space rendition is just average, reaching a mediocre 60% of the sRGB color space. 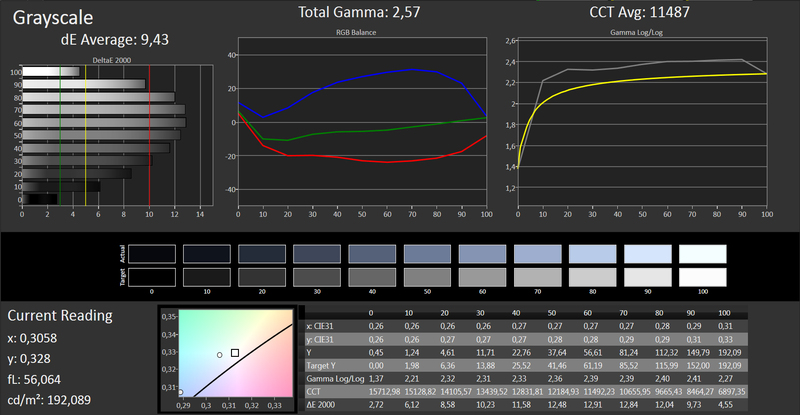 Other than that, no calibration seems to have been performed by the manufacturer, with large deviations for the grayscale rendition, color accuracy and color saturation parameters. 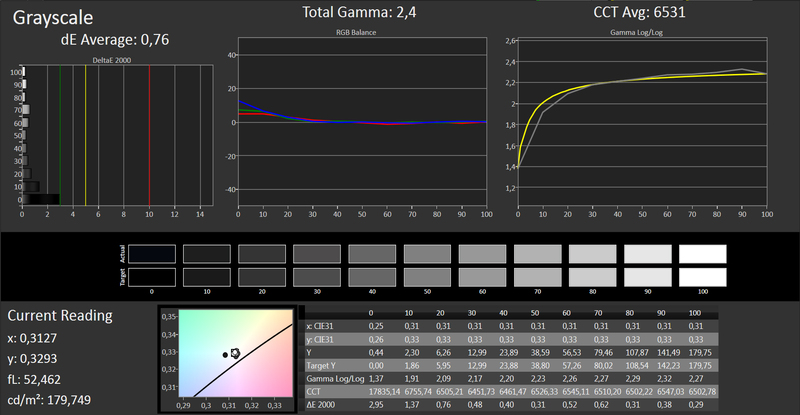 However, after a calibration has been performed, at least the grayscale rendition and the gamma curve are very close to their respective ideal values. 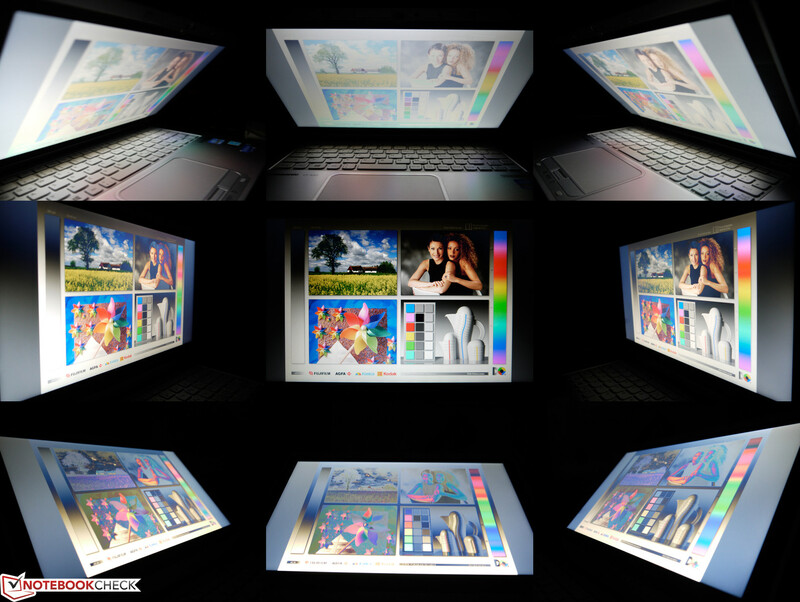 We can't comprehend why Panasonic has chosen to use a standard TN panel in such a premium hybrid ultrabook - especially since most other manufacturers use IPS panels or at least TN panels with wide viewing angles. Especially the CF-AX2's vertical viewing angle stability is outright horrendous, with quickly developing bleached, inverted and distorted colors. This is an especially serious problem when the hybrid device is used as a tablet in portrait mode. 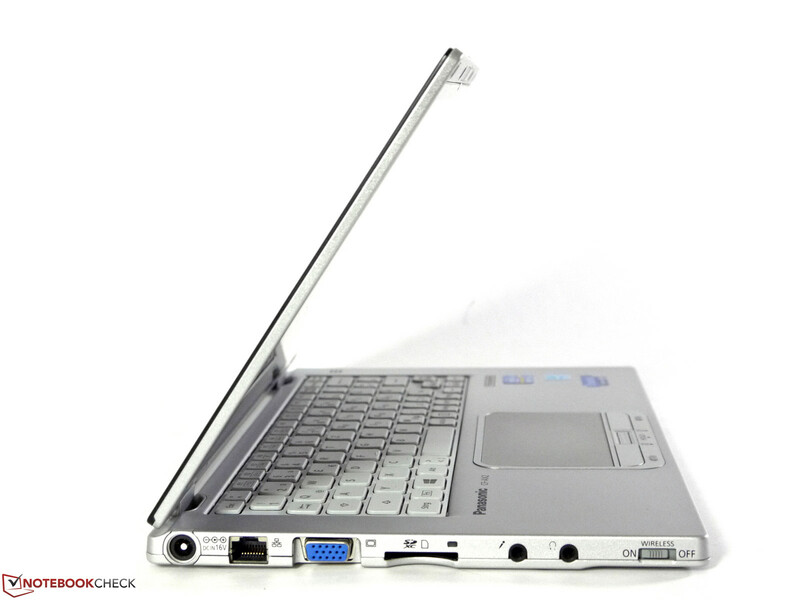 No huge surprises here: As is the case with many ultrabooks, the Toughbook is powered by an Ultra Low Voltage CPU, economical DDR3L RAM, an integrated Intel HD GPU and a low-power mSATA Solid State Drive, leading to a great balance between performance and battery life. 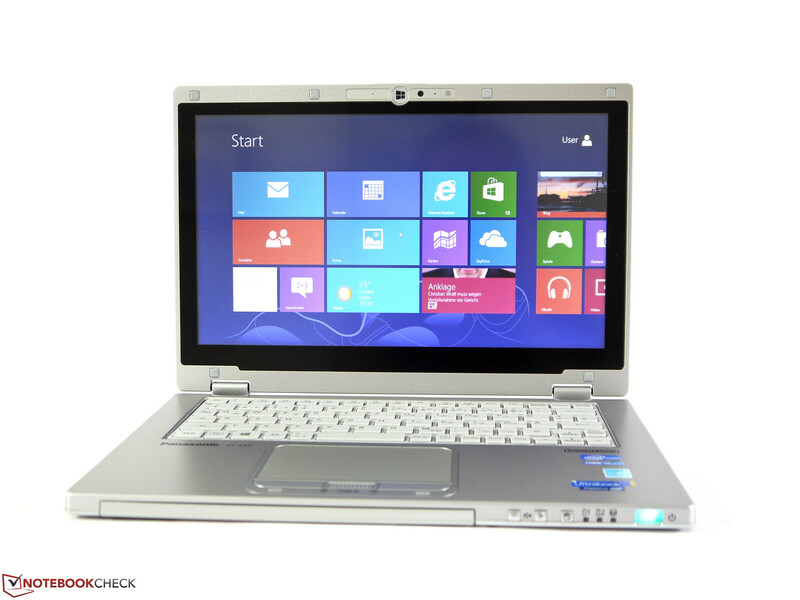 Our test device comes with an Intel Core i5-3427U, 4 GB of RAM and a 128 GB SSD. No other configurations seem to be offered at the time of this review. 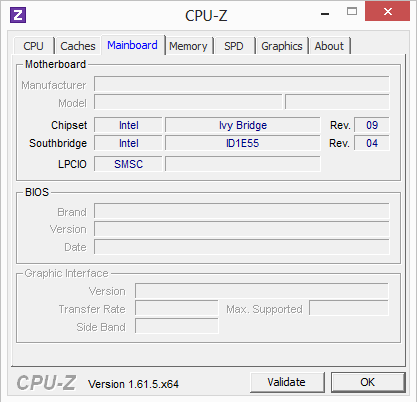 Intel's Core i5-3427U is no Haswell CPU, but stems from the older Ivy Bridge generation instead. 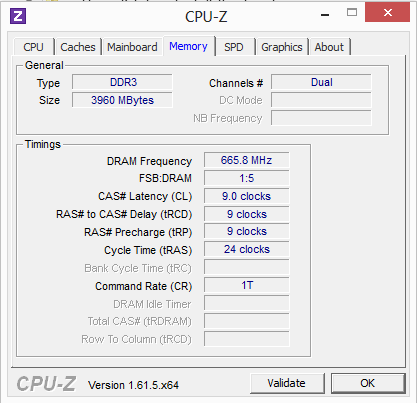 It comes with a rather low Thermal Design Power of just 17 watts, Hyper-threading (up to 4 threads can be processed at the same time) and Turbo Boost technology (the base clock speed of 1.8 GHz can be increased to up to 2.8 GHz when necessary), leading to either a very high single-core performance or a number of operations being processed simultaneously, depending on the requirements. 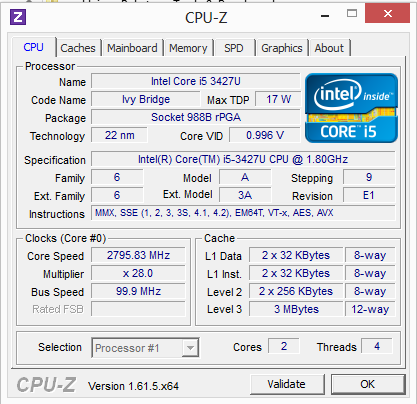 The benchmark results come close to those of an Intel Core i5-2410M CPU with a TDP of 35 watts, sometimes even those of an Intel Core i7-720QM CPU with 45 watts. 3378 and 7877 points during the single and multi tests of the Cinebench R10 32-bit are very decent results, as are 799 seconds during the SuperPi-32M calculation (single) or the 606 seconds for wPrime-1024m (multi). We have also confronted the CPU with everyday tasks. The iTunes audio conversion test leads to a speed factor of 41.3. Video conversion runs approximately as fast as that done by an Intel Core i7-4500U CPU like the one in Lenovo's ThinkPad S440. No throttling issues and no performance reduction while running on battery were noted. 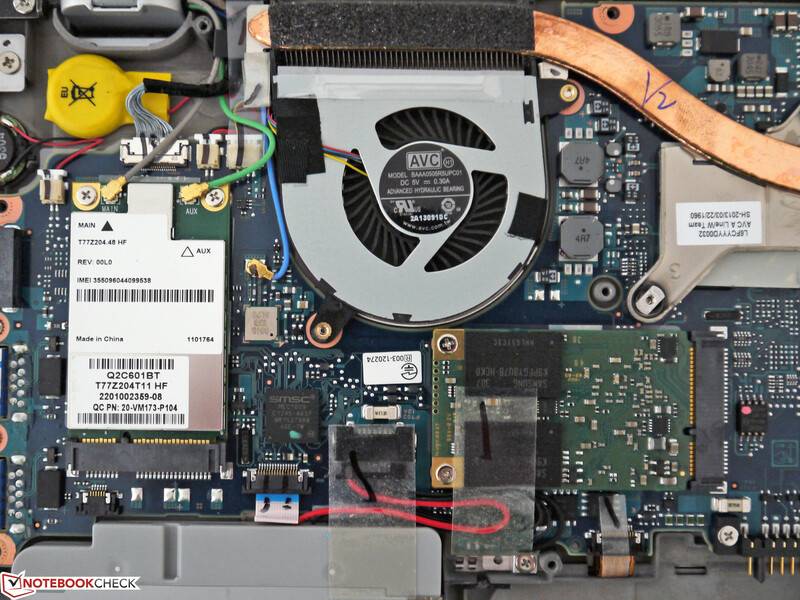 The system components appear to be well-balanced in terms of their respective power. The usual office, image editing and even video conversion tasks run quickly - the latter only via Intel's Quick Sync Video (without support for this technology, any conversion software takes a lot longer for the entire process). 4 GB of RAM is a bit on the low side and appears even less future-proof due to its non-expandability. At least two banks are used, leading to dual channel mode being active. 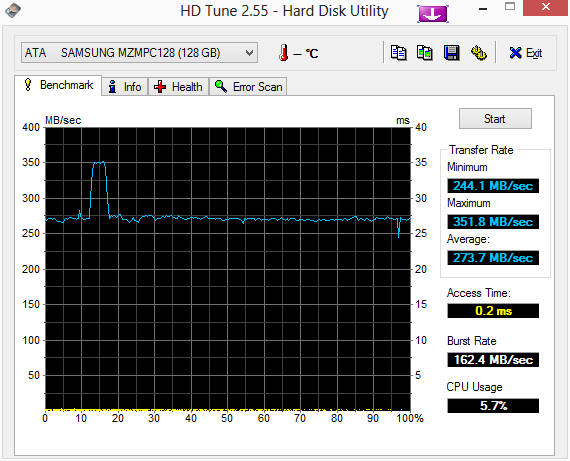 The mSATA SSD is very fast, but it might quickly become too small for those who store a lot of data. Luckily, the SSD can be swapped for a larger model. 12296 points during the PCMark Vantage application benchmark and 4713 during PCMark 7 have been measured. 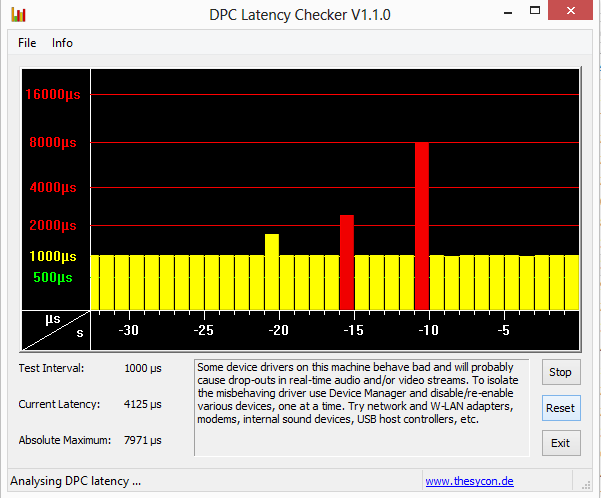 Using the DPC Latency Checker, we looked for possible synchronization issues when using external hardware. Even after the "usual suspects" (Wi-Fi, WWAN, Ethernet) had been deactivated, peaks of up to 8000 µs were measured. One would have to invest more time to look specifically at different driver versions to have a more detailed look at this issue. 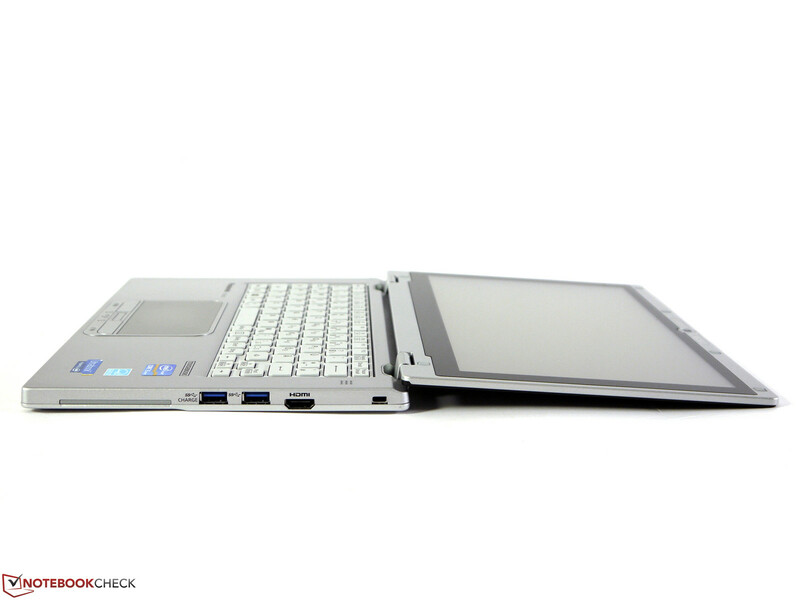 Due to the slim and compact chassis, only an mSATA drive can be used in the Toughbook. The Samsung SSD MZMPC128HBFU comes with a capacity of 128 GB. With sequential data transfer speeds of more than 450 MB/s (reading) and approximately 250 MB/s (writing) as well as access times of 0.2 ms, it is perfectly on par with comparable 2.5-inch drives, making it one of our favorite mSATA drives. The only possible way to upgrade the drive is by replacing it with another mSATA SSD. These can be had with as much as 512 GB of storage, but the price is astronomical: The Samsung PM841, for example, costs approximately $600. Intel's HD Graphics 4000 is a rather powerful integrated GPU which is more than sufficient for almost all everyday activities. Image editing, Full HD video playback, video conversion via Intel Quick Sync Video and even less demanding games work well. Only modern 3D games and 3D construction software (CAD) demand too much of Intel's GPU. Some of our benchmark results are notably better than previous ones concerning the same GPU (Intel HD Graphics 4000): 4870 points during 3DMark06, 3166 points for 3DMark Vantage and a score of 4976 for the OpenGL Shading test of Cinebench R10 are all more than decent results for an integrated GPU. 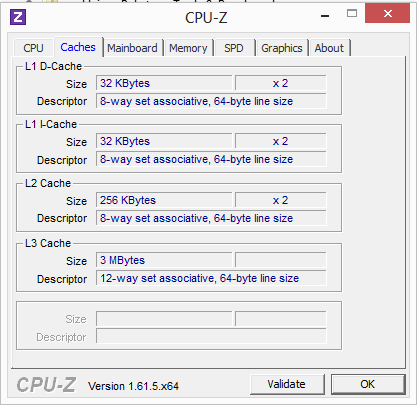 Some of this is due to the dual channel RAM, as the RAM is used by the GPU as well (shared memory). Again, no throttling issues and no performance reductions while running on battery were noted. Only less demanding titles can be played smoothly, and only with a low enough resolution. We tested Diablo 3, World of Warcraft and F1 2012. However, Crysis 3, BioShock Infinite or Hitman: Absolution will be no fun at all. Naturally, casual games such as Cut the Rope or Fruit Ninja (which also use the touchscreen) will not pose any problems. Overall, the CF-AX2 remains pleasantly quiet. 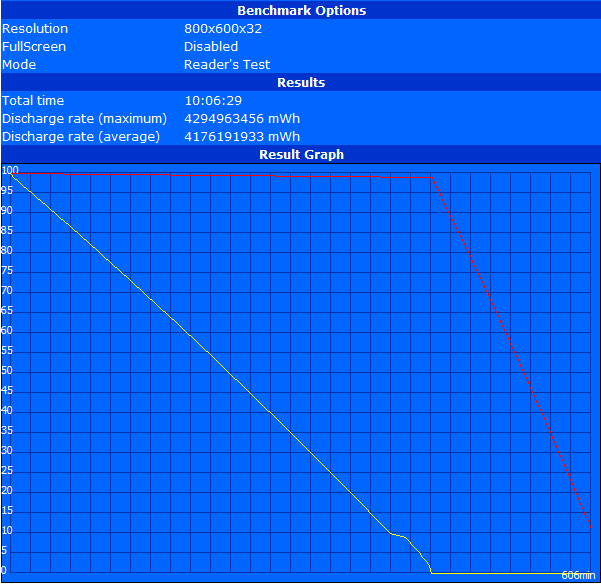 28.9 dB(A) while idle is barely audible, but this result can only be reached when the fan mode is set to "low" within the Panasonic Power Plan. Opening a number of browser tabs or copying some files leads to a slight increase in rotation speed and noise (31.8 dB(A)). 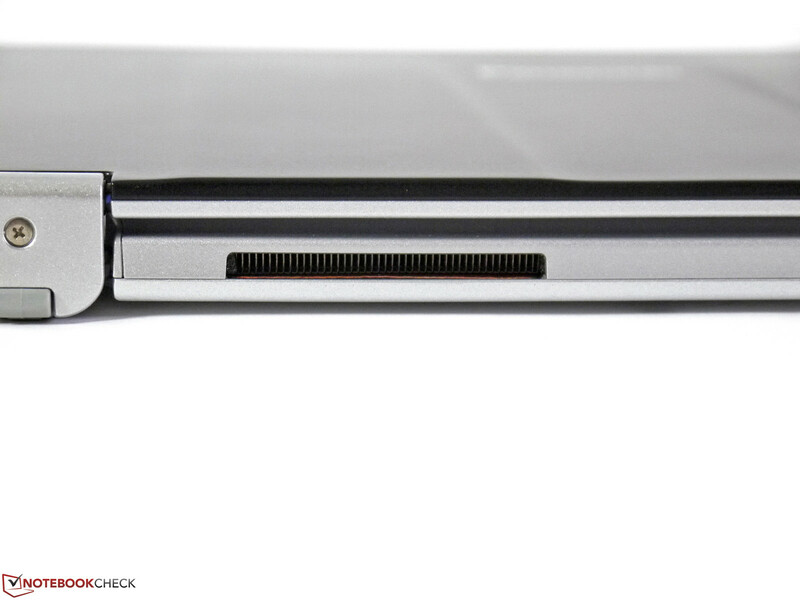 The solid state drive is audible (due to a faint chirping noise when writing or reading data), but never becomes annoying. Under medium load (video conversions, games, etc. ), 41.1 dB(A) is reached after a few minutes, with an ultimately disturbing maximum noise level of 43.2 dB(A) under full load. Our test device almost always remains cool. Only the rear part around the fan vent can heat up, up to 47.2 °C under continuous full load. Most other parts only see moderate increases in temperature, barely registering much more than 30 °C. There is only one speaker (on the right hand side of the keyboard, below a number of little holes) leading to tinny, distorted audio output with an over-emphasis on the highs. External speakers should be used during presentations to improve the sound quality. Luckily, two audio jacks are available so that even headsets with two connectors can be used. 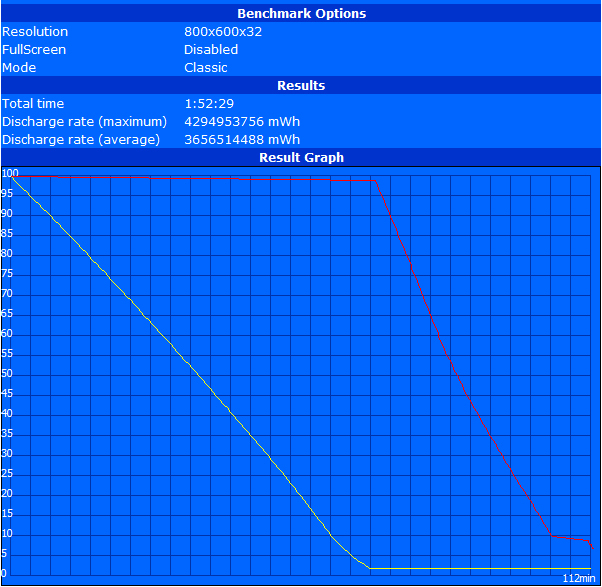 We measured a power consumption of 4.9 to 36.7 watts. 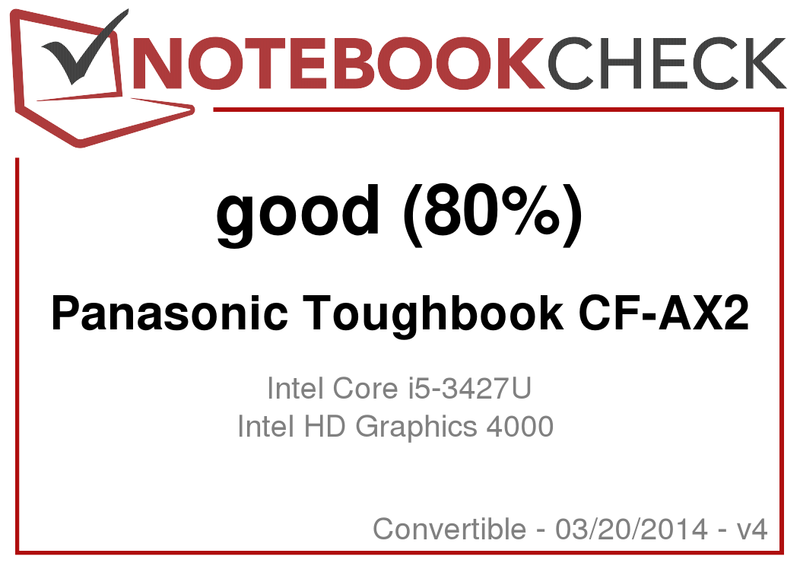 These nice values are the result of the consequent usage of low-power components as well as the Toughbook's mediocre peak screen brightness. Thanks to a large 48 Wh battery, this translates into very good battery life. 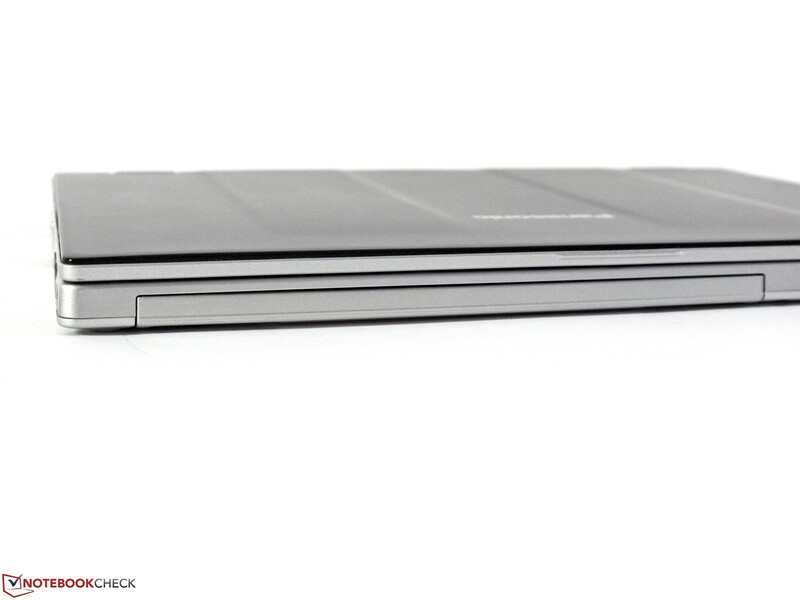 One peculiar thing about the Toughbook: Instead of one battery, it ships with two, a built-in 17 Wh battery and a swappable 31 Wh model. 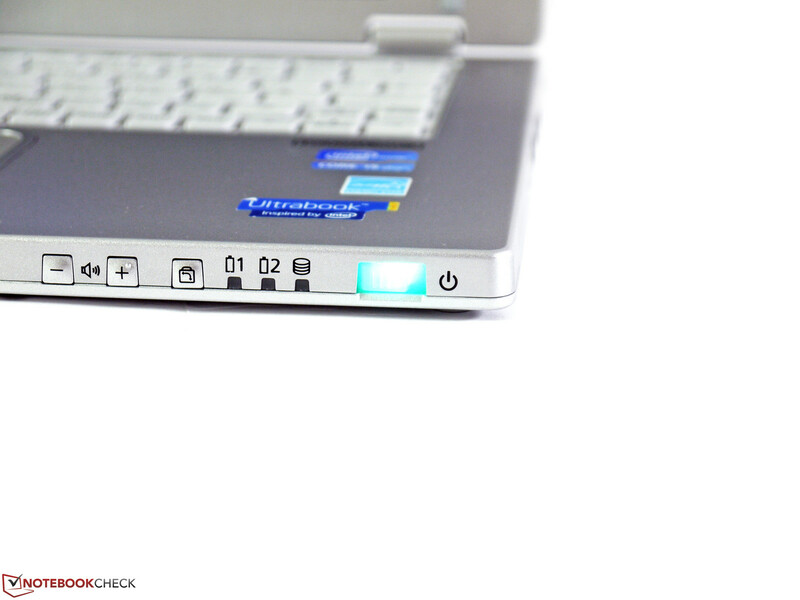 This allows the user to exchange the larger battery even while the laptop is running (hot swap system). The power adapter is amply sized; its 90 watts will be more than enough during any possible usage scenario. 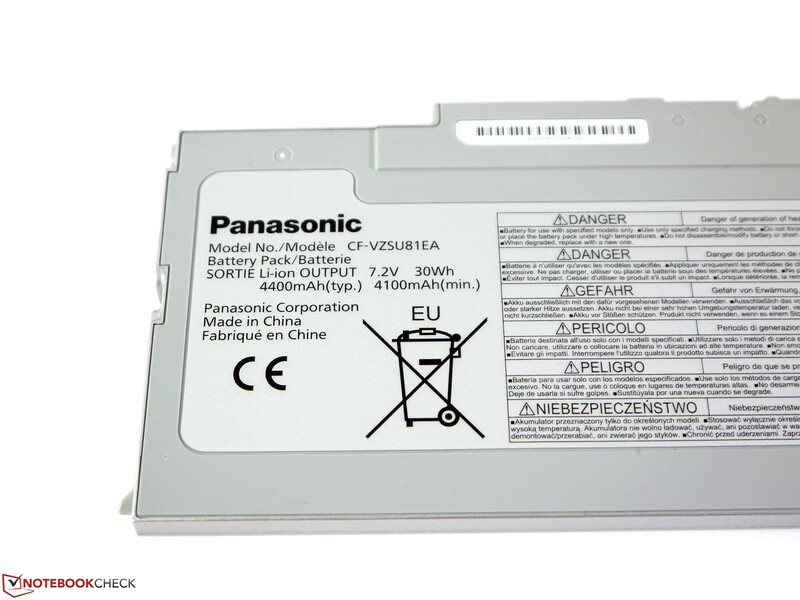 Our measurements actually manage to surpass the 8 hours Panasonic claims with a value of more than 10 hours during Battery Eater Reader's Test (minimum display brightness at 10 cd/m², energy saving profile, airplane mode). During the more realistic Wi-Fi test scenario (display brightness at 143 cd/m², activated radios, energy saving profile), 5:24 hours remain. Almost 2 hours of runtime can be squeezed out of the machine under full load (maximum display brightness, high performance profile, activated radios: Battery Eater Classic Test). 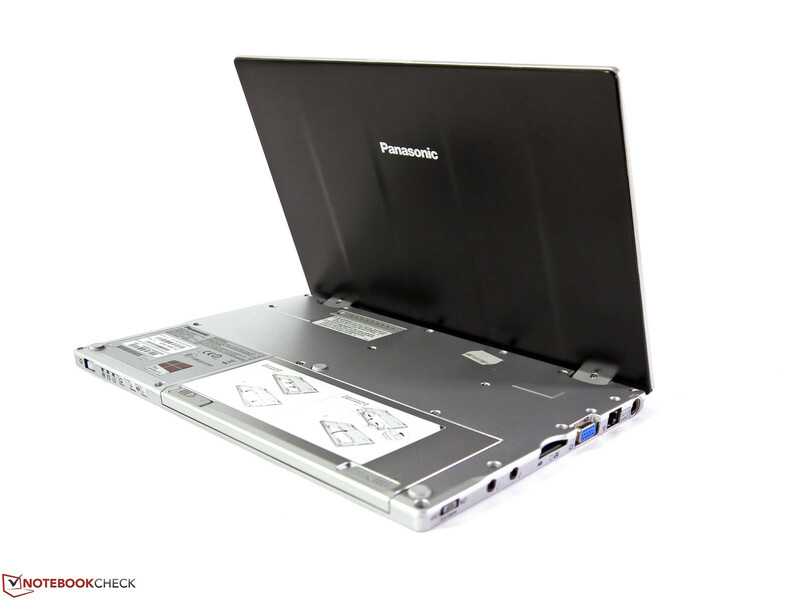 Panasonic's ruggedized business hybrid ultrabook, the Toughbook CF-AX2, comes with a sturdy case, an extremely low weight, decent performance, all essential ports and an interesting 360-degree-hinge for the display. However, the innovative concept is not without its flaws. First off, the display, despite being of the matte variety, is just mediocre. 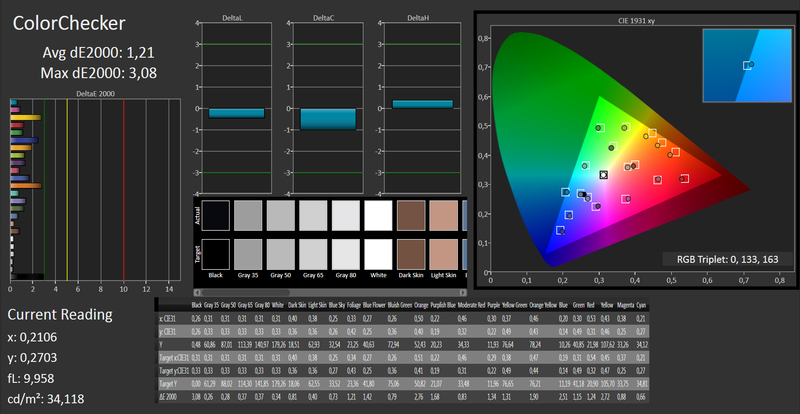 While the low display resolution and the average contrast ratio (when compared to the competition) might not be too much of an issue, brightness levels and viewing angles are completely insufficient for outdoor usage. Unfortunately, the keyboard isn't great either. While all the basics are done right, the end result just doesn't lead to a comfortable typing experience due to smallish keys, low-contrast lettering and the utter lack of any backlighting system. 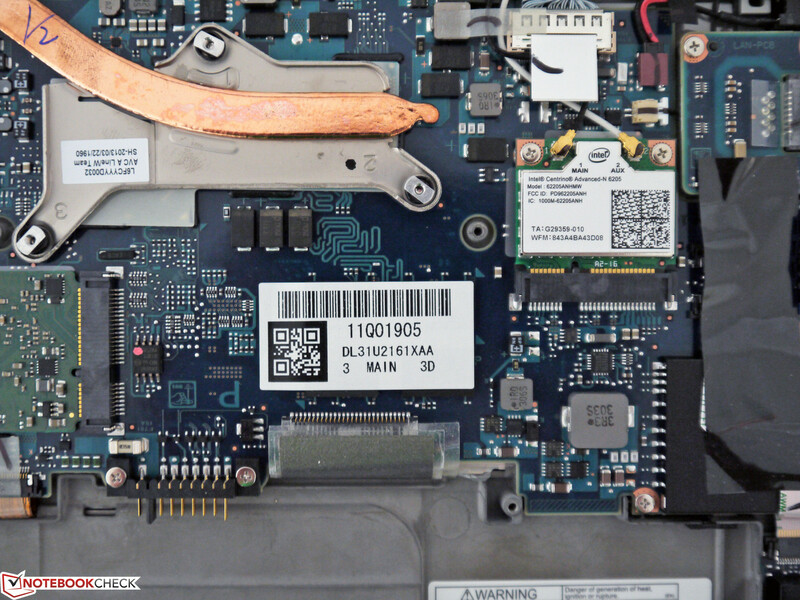 However, there are some distinct features that add a lot of value to the Toughbook, including the integrated WWAN module and the hot-swap battery exchange system. Both components are incredibly helpful during mobile usage. 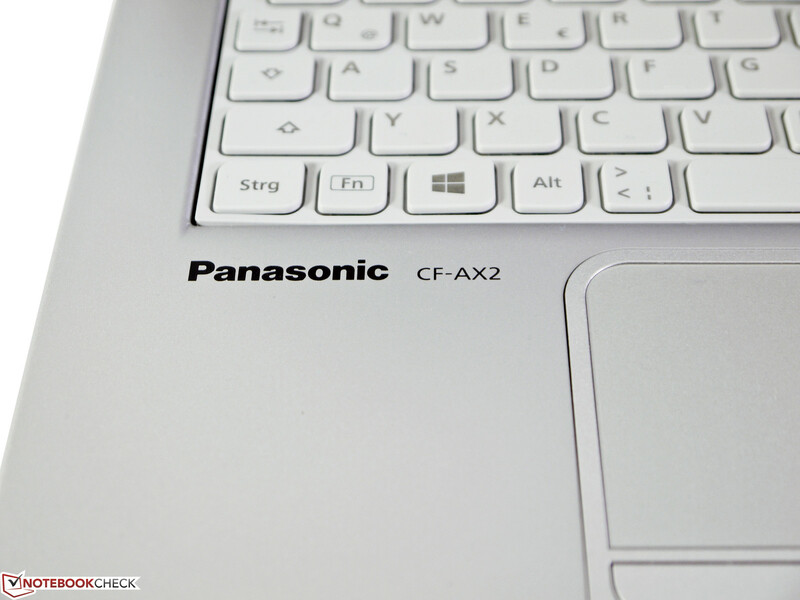 We can understand that Panasonic chose to set such a premium price for all the great ideas the Toughbook CF-AX2 has to offer. What we don't get is why of all things the display and the keyboard have to come with so many unnecessary limitations. ...and a weight of up to 100 kg. ...quickly turning the laptop into a tablet. The keyboard is deactivated in tablet mode. It would be possible to downgrade to Windows 7 (Windows 8 comes preinstalled). The battery is built into the front part, serving as a counterweight to the display. 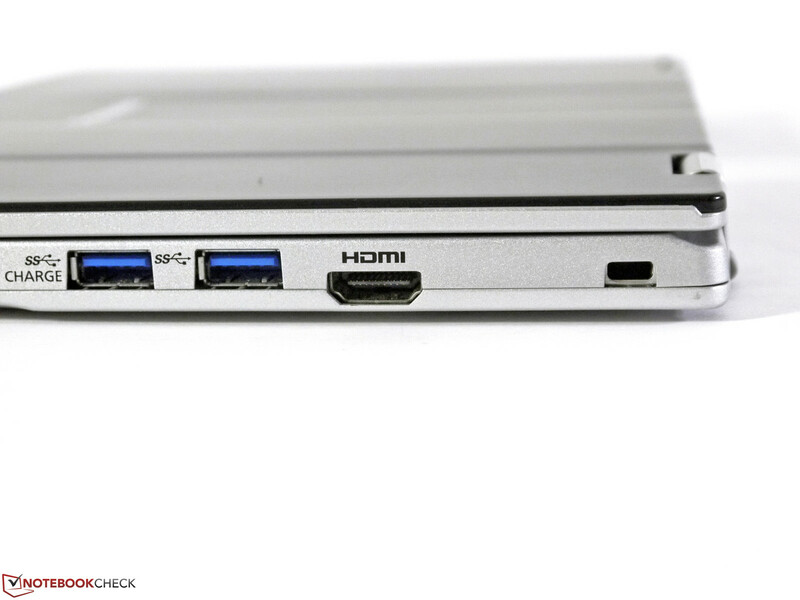 The HDMI and USB 3.0 ports are too close together when large flash drives or wide adapters are used. An optional Smart Card Reader is available. A Kensington lock for security purposes. The analog VGA port offers good signal quality. Two separate audio ports instead of a combined Line In / Out port. The hinges are sturdy, keeping the display firmly in position. 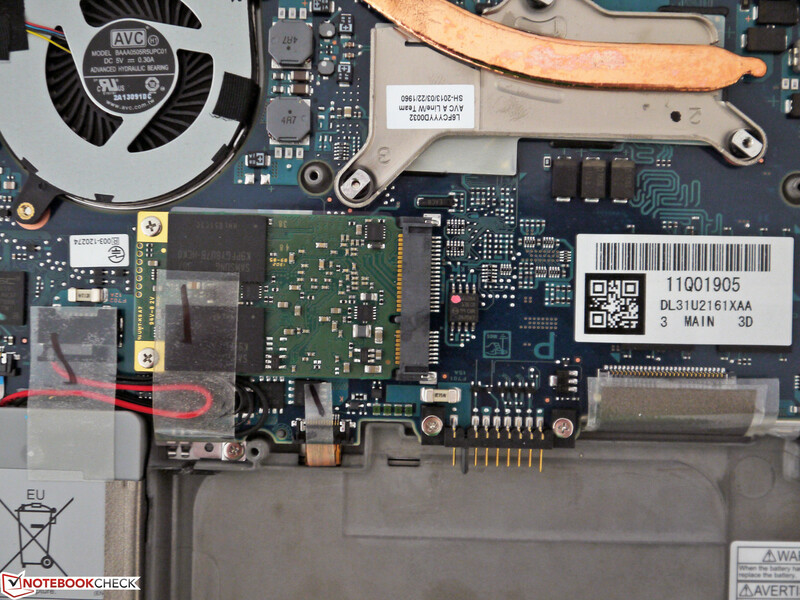 Next to the fan vent, the laptop gets up to 47 °C hot under full load. The surfaces appear to be easy to clean. The display lid is very torsion-resistant. 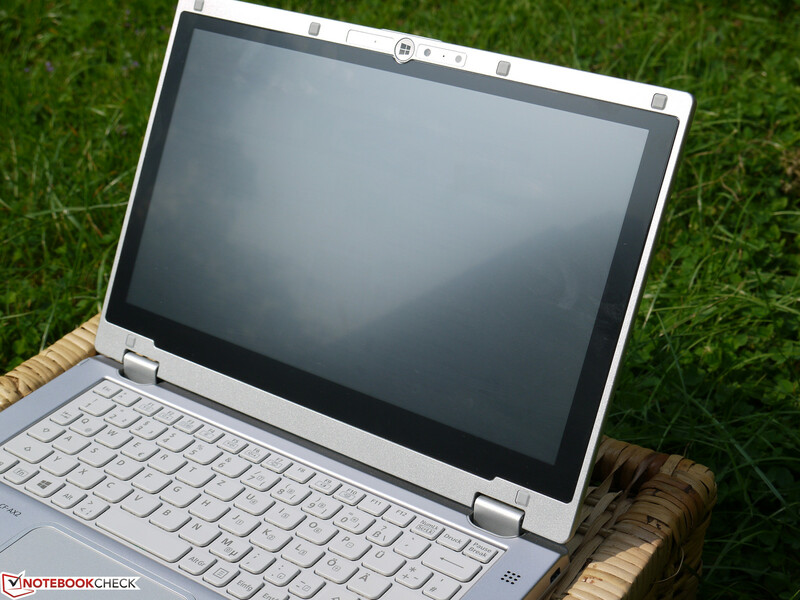 The touchpad is large, offering smooth gliding characteristics. The Power-ON LED can be annoyingly bright in dark surroundings. Large power adapter: 90 watts. 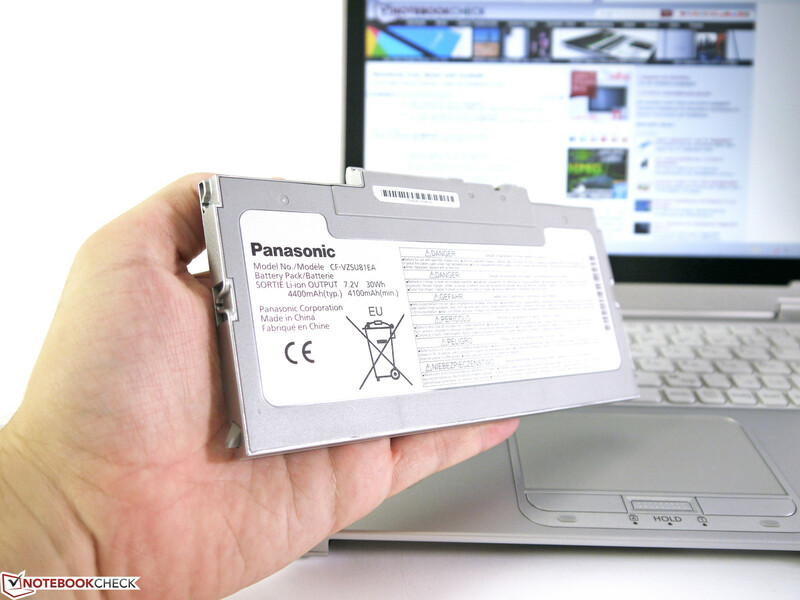 The hot swap battery system allows the battery to be replaced while the laptop remains running. 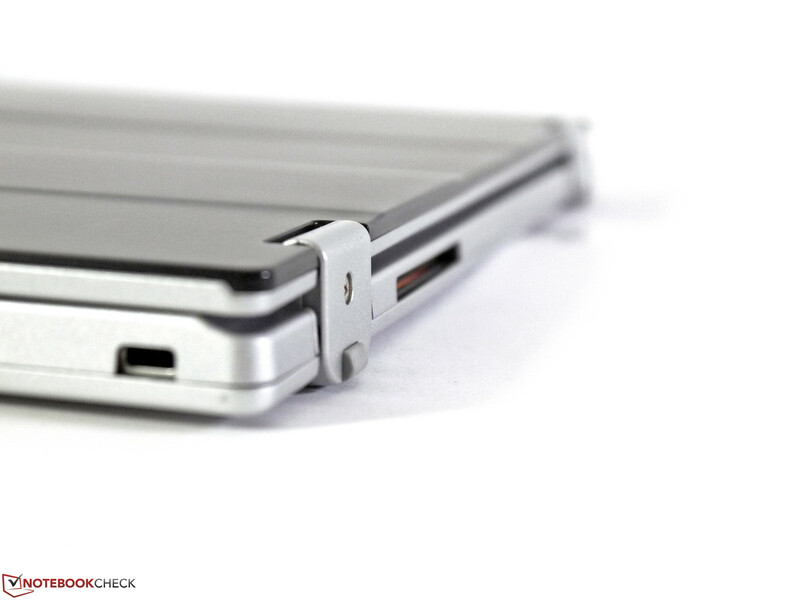 ...with the integrated battery providing 17 Wh and the swappable one providing 31 Wh. The integrated WWAN module (made by Sierra Wireless) allows mobile internet access. An mSATA solid state drive with 128 GB is preinstalled. 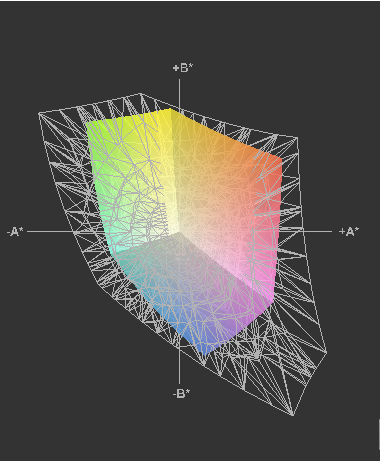 The fan is usually on the quiet side, but under full load it can reach up to 43 dB(A). 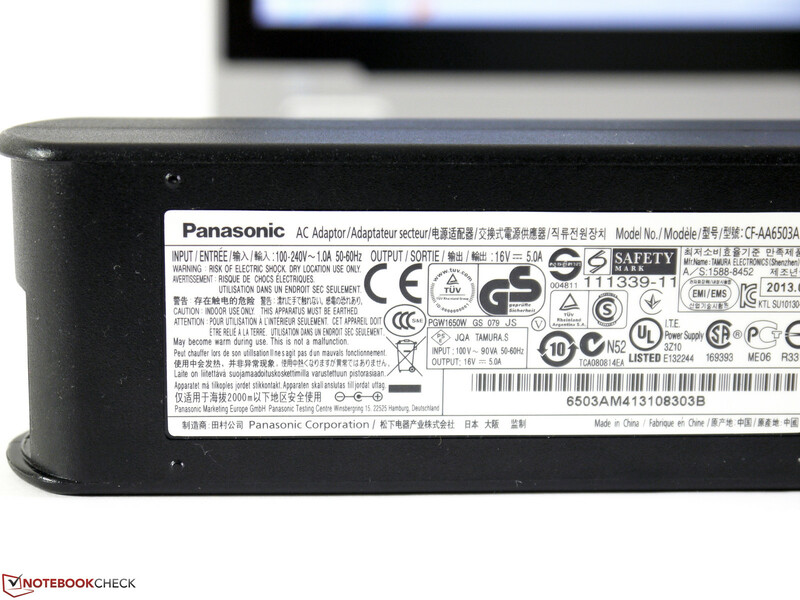 The battery charger (image taken by Panasonic). The 360-degrees-hinge, the hot-swap battery system, the decent battery life, the good system performance and the useful selection of ports. 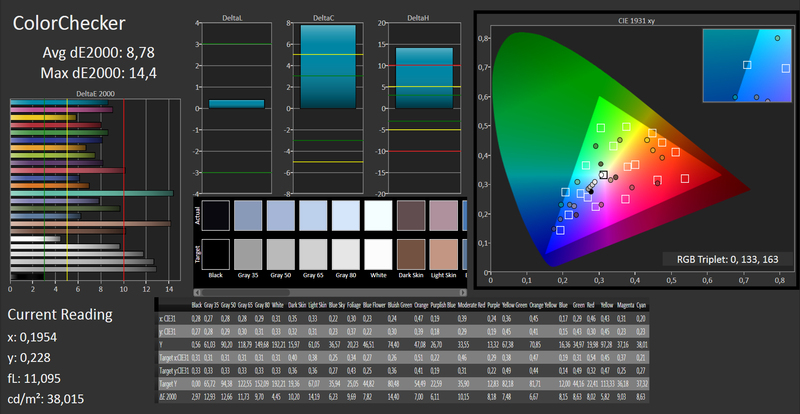 A better display with increased brightness levels and more stable viewing angles. That of all things it is the display that spoils the overall impression. 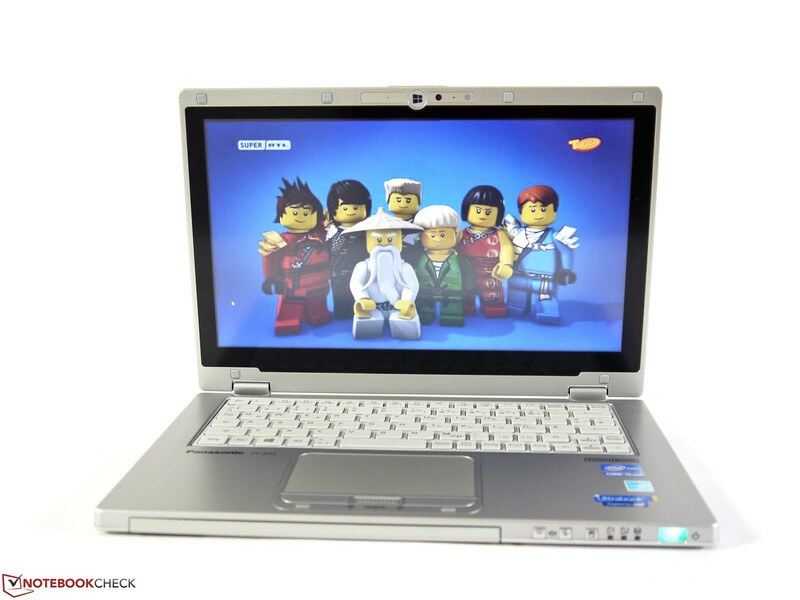 HP EliteBook Revolve 810, Sony Vaio Duo 11 and 13, Dell Latitude XT3, Lenovo ThinkPad X220T, HP EliteBook 2760p, Fujitsu LifeBook T902.